Phil Chadwick's Art: #0093 "Quaint Cove"
Peggy's Cove was quiet in 1979. There were tourists but not like now. We spent a lot of time at Peggy's Cove in the BC Era - Before Children. The best days were during the nastiest and windiest fall and winter storms. 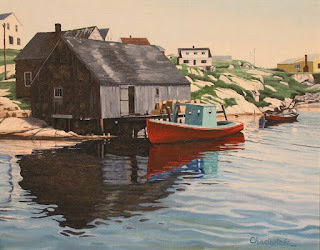 One could safely watch the waves crash over the rugged granite shore while enjoying a bowl of really tasty chowder at the Sou'Wester Restaurant ... Good times all brought back to the top of one's memory by a simple painting. For me that is what art is all about. If the art invokes similar memories in others, then that is definitely special. CFB Shearwater was my first meteorological posting. If you wish to learn about the weather, go east young man. The weather was always changing and the art of a careful analysis of the science and the observations were key to understanding the meteorology and the concern of the day. I wish I had a few of those early analyses on hand plotted maps with coloured terrain. The weather of the eastern seaboard taught me a lot. I am still learning.